This photo was taken by Lin Chambers in 1997, right outside the S'COOL office at NASA Langley Research Center in Hampton, Virginia. It shows the extensive build-up of persistent contrails resulting from our location along the East Coast flyway. This group of three contrails was captured by Ed Donovan of Berry Shoals Intermediate School, on January 28th, 2002 in South Carolina. It shows a series of contrails formed by planes following a very similar route, but then being advected to the left by upper level winds. Note that the leftmost contrail is the thickest, suggesting it has been forming the longest, while the rightmost contrail is still quite thin. Also note that the apparent convergence of these contrails is likely attributable for the most part to perspective. This beautiful display was captured at sunset also by Ed Donovan of Berry Shoals Intermediate School, on January 28th, 2002 in South Carolina. Note the delicate structure in the middle contrail, which results from local air motions induced by the airplane. Here is a nice shot of a tropical contrail. There are cumulus clouds on the horizon only. In this case I would not report the cumulus clouds; they are too far away to be in the satellite field of view. There is also some distant high cirrus. 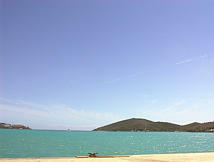 Photo taken by Doug Stoddard in March 2002 in St. Thomas. 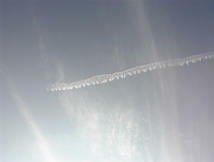 A contrail fragment under a thin veil of cirrostratus clouds. Note the wiggles along the edge of the contrail. 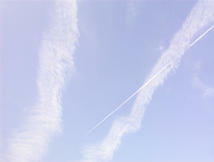 This is very typical of contrails, because of the trailing vortices from the airplane. 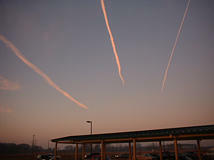 It is a great clue to help identify older contrails. 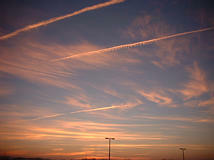 This contrail is definitely persistent - the airplane is nowhere in sight, and the contrail has had some time to widen. Also note that the contrail ends on the left in an area where the cirrostratus clouds also stops. This is a good indication of a region of low humidity air. Photo taken by Lin Chambers in August 2003 in southeastern Virginia. 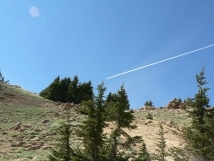 This photo shows a contrail being formed (although the plane cannot be seen in the photo it is at the point of the narrow contrail). This contrail is persistent - it is not disappearing behind the plane. The other two braod cloud structures are also likely to be contrails, but very old persistent contrails which have spread a great deal. Except for their shape, there is little to distinguish these from natural cirrus. Note how much wider they are than the new contrail however. This is a good illustration of the reasons scientists want to know more about contrails: they can grow to fill large portions of the sky. Photo taken by Lin Chambers in August 2003 in southeastern Virginia. This photo captures a passing plane leaving a very defined thin contrail, with a very faint and diffuse old contrail just barely visible. Along with a clear blue sky, these are indicators of a moderately dry atmosphere. Photo taken by Dr. Debra Krumm in September 2006 at Lassen Volcanic National Park near Mineral, Callifornia.